Some of us in the theme park world have known for a while that when Universal Studios Hollywood announced they too were getting a "Wizarding World of Harry Potter" area that something would have to give. It seems today that Universal has confirmed what areas have made the chopping block in order to give the boy wizard his new Hollywood home. Not giving fans much time, these areas closed TODAY with news only really breaking on August 27th, many of us didn't spot it quickly enough. In the list of "GONE" we've got the rather famous but now waning "Gibson Amphitheater" which has held a place of glory inside the park. It opened in 1972 and is still the 3rd largest Amphitheater in Hollywood today. According to Wiki (I know, not the best) the venue has events listed through October but Universal has decided it closed today. We knew the Gibson closure was coming, it will make room for the Hogwarts Express and the key attraction, Forbidden Journey. Up next is the Flintstones Carnival Games area, which rumor has it will be relocated to the new 'Despicable Me- Super Silly Fun Land" area. Inside Universal reports these are being removed to make way for the parks new "gathering area" which will include a box office, water feature and shopping/dining. Also disappearing, possibly being moved into the new "Super Silly Fun Land" area is the water/play area "Adventures of Curious George". This isn't surprising as many of us suspected it would either be removed soon or re-themed. 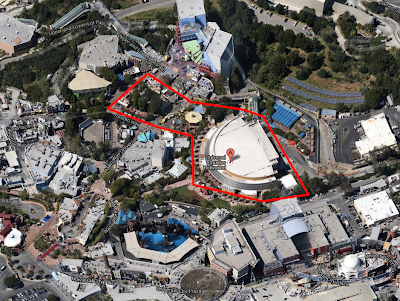 It sits directly next to Gibson Amphitheater, so it seems to be falling under the axe also. Last on the list is a part of the "Studio Tour" called "The Mummys Tomb". I honestly don't know much information about this part of the tour, so I can't really comment on it but a rumor found over on Screamscape states that the tunnel effect of the attraction hasn't been working well over the summer. Line many not be exact, working in a rather cramped area. I've outlined the areas being removed in red, so you have an understanding of how drastic a change this will be for the small but historic park. When WWoHP was added into Islands of Adventure at the Orlando resort, it wasn't removing anything as large as this nor was it taking out a classic theater (The London/Diagon Alley area is still a sore spot which we won't talk about here). I'm honestly not sure how I feel about this yet.